May 21, 2009: Jane Fountain, Professor of Political Science and Public Policy and Director of the National Center for Digital Government and Marilyn Billings, Scholarly Communication & Special Initiatives Librarian at the W.E.B. Du Bois Library at UMass Amherst, have been awarded a $250,000 grant from the National Science Foundation’s Office of Integrative Research to beta test cybertools and cyberinfrastructure for an interdisciplinary, multimedia, and international online beta repository to support ethics in science and engineering. See a complete press release here. April 17, 2009: Jane Fountain, STS Director and Director of the National Center for Digital Government, discussed the advantages and possible drawbacks of using technology to promote transparency in government operations with Mass High Tech. Read the article here. April 1, 2009: Applications are now being accepted for the International School on Digital Transformation, an intensive six-day residential program, conducted in English that brings together emerging and established scholars and professionals from around the world. Digital communication scholar and STS affiliated faculty member, Martha Fuentes-Bautista, will speak at the program. For more information and to apply, visit this website. Under the direction of Stuart Shulman, an award winning qualitative methodologist and Assistant Professor of Political Science, QDAP offers researchers training, consulting services, and qualitative data coding and analysis. Shulman and colleagues have developed a range of state-of-the-art qualitative analysis tools and applications. QDAP has conducted large-scale coding and analysis for research projects in biomedical, public health, education, behavioral, computational and social sciences. QDAP offers coding in 12 languages and research support for a range of key project management tasks. Its tools and applications have been developed with support from the NSF. Visit QDAP's website for more information. UMass Amherst has received funding to expand a project to bring more women and underrepresented minorities into information technology (IT) and computing education and careers throughout Massachusetts. 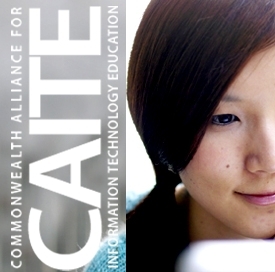 The National Science Foundation (NSF) recently awarded a $1.9 million grant to extend the Commonwealth Alliance for Information Technology Education (CAITE) for an additional 2 years and to add 6 additional institutions to the existing alliance. CAITE works to raise awareness of and improve preparation for information technology and computing careers and educational pathways, especially among groups that are underrepresented in the Massachusetts innovation economy; that is, economically, academically, and socially disadvantaged residents. Since CAITE began its work less than two years ago, approximately 5,000 students and educators have participated in more than 30 activities—from career days and college fairs for high school students, to workshops for teachers and guidance counselors. The new grant funding offers the unique opportunity for CAITE to work with more than half of Massachusetts’ public campuses, including three-fifths of the community colleges, to expand the educational pipeline and create clearer and more nurturing paths from high school, through community college, and into four-year programs. These efforts will dovetail with the Massachusetts Department of Higher Education’s efforts to institute the MassTransfer program and better community college transfer options. Community colleges are the centerpiece of CAITE because of the central role they play in reaching underserved populations and in acting as a gateway to careers and further higher education. “Community colleges offer a real opportunity to bring highly capable people into information technology education and the workforce who, for a variety of reasons, have been prevented from participating fully in the knowledge economy,” said Adrion. CAITE outreach extends into four Massachusetts regions that have high percentages of families living below the poverty level, minorities and immigrants, and low percentages of students graduating from high school, going to four-year colleges, and participating in the knowledge economy. These regions are eastern (Boston area), southeastern (Fall River, Dartmouth, and the Cape), western, and central Massachusetts (Lowell, Lawrence, and Worcester). CAITE began in March 2007 with support of an initial 3-year grant of $1.9 million from the NSF’s Broadening Participation in Computing (BPC) program, which aims to significantly increase the number of U.S. citizens and permanent residents receiving post-secondary degrees in the computing disciplines, with an emphasis on students from communities with longstanding under-representation in computing: women, persons with disabilities, and minorities. The project leadership includes Adrion, as well as and Lori Clarke, professor of computer science, and Jane Fountain, professor of political science, both of UMass Amherst; Deborah Boisvert, director of the Boston Area Advanced Technological Education Connections (BATEC), and Priscilla Grocer, chair, department of computer information systems, Bristol Community College. Computer science and information technology faculty members at each alliance partner campus lead work on their own campuses. CAITE builds on partnerships with the Commonwealth Information Technology Initiative (CITI), BATEC, regional Louis Stokes Alliances for Minority Participation and Alliances for Graduate Education and the Professoriate (AGEP) programs, also funded by NSF, and other initiatives focused on information technology education and science, technology, engineering, and math (STEM) pipeline issues. CAITE is one of 10 NSF BPC Alliances across the nation, each of which is a broad partnership of institutions and organizations that focus on particular strategies and/or groups underrepresented in computing. CAITE is one of two statewide alliances and the only alliance that focuses on community colleges as a gateway to IT education for many Massachusetts students. Jane Fountain, Professor of Political Science and Public Policy, Director of the National Center for Digital Government, and Director of the Science, Technology and Society Initiative has been appointed to the World Economic Forum’s Global Agenda Council on the Future of Governments. Fountain is one of thirteen experts worldwide selected for membership on the Future of Governments Council, which will examine how governments globally might better adapt to the rapid pace of technological change while building or maintaining transparency, accountability, and civil society. Based in Geneva, Switzerland, the World Economic Forum is an independent, international organization convening world leaders and government officials in dialogue with leading researchers and experts to develop “global, regional and industry agendas.” Working through a series of Global Agenda Councils, the World Economic Forum convenes the most innovative and relevant leaders capable of capturing the best knowledge on each key issue and integrating it into global collaboration and decision-making processes. For more information about Fountain’s research on technology and governance, and the work of researchers at the National Center for Digital Government, visit the Center’s website at www.ncdg.org. Funded by the National Science Foundation, the National Center for Digital Government builds global research capacity, strengthens the network of researchers and practitioners engaged in building and using technology in government. January 10, 2008: Marc Achermann has released a description of his Spring 2007 course, Ethics for Scientists & Engineers. This 2-credit course is an introduction to the variety of ethics topics found in academic research with case studies that are relevant to nanoscience and nanotechnology. Click here [pdf] for a course flyer and register today! January 2, 2008: In summer 2008, the Social Science Research Council will sponsor twelve (12) Dissertation Proposal Development Fellowships in the field of Critical Studies of Science and Technology Policy, with an emphasis on comparative and international topics. These fellowships will fund participating graduate students at US universities to pursue predissertation summer research and to attend two integrated workshops designed to prepare them to learn and explore research and dissertation proposal development strategies in STS and closely related fields. IIf you have any questions, they can be directed to one of Sheila Jasanoff, Professor, Harvard Universty (sheila_jasanoff@harvard.edu) or Clark Miller, Associate Professor, Arizona State University (clark.miller@asu.edu) or the SSRC. October 27, 2007: The Commonwealth of Massachusetts, Executive Office of Energy and Environmental Affairs and Office of Technical Assistance and Technology is organizing a conference on the safe development of nanotechnology, on November 15, 2007 in Marlborough, MA. For more information about the conference or to register, visit the EBC website here. October 20, 2007: Associate professor of Communication at UMass Amherst and NCDG Faculty Affiliate, Paula Chakravartty has co-edited a new book about global communication entitled Global Communications: Towards a Transcultural Political Economy. Faculty Affiliate Mari Castañeda is a contributor to the work. For a short article on the book click, here. To order a copy of the book from the publisher, click here. October 10, 2007: Jarice Hanson, Professor of Communication at UMass Amherst and Verizon Chair at Temple University, organized the Digital Democracy and Freedom of Speech web conference, held in the WHYY studios in Philadelphia, PA on October 9, 2007. The entire conference is archived at the WHYY website until December 31, 2007. Click here for the PDF poster. We encourage you to use the video and resources available on the conference website to discuss freedom of speech in a digital era with your students and colleagues. Sept. 15, 2007: The National Science Foundation announced that a group of eight researchers from the University of Massachusetts Amherst will be awarded $300,000 to build, evaluate, and disseminate a series of international ethics modules for science and engineering students. The group, led by Political Science and Public Policy Professor Jane E. Fountain, represents six academic departments from four colleges and includes Paula Stamps, Professor of Community Health Studies; MJ Peterson, Professor of Political Science; Marc Achermann, Assistant Professor of Physics; Beverly Park Woolf, Associate Research Professor of Computer Science; Neal Anderson, Associate Professor of Electrical and Computer Engineering; John Hird, Professor of Political Science and Public Policy, and Peter Haas, Professor of Political Science. The project will work in partnership with researchers from the University of New Mexico and Northeastern University. For the complete press release, click here [PDF]. April 5, 2007: Charles Schweik and David Greenberg (Mohawk Trail Regional School District) have received a CITI Grant to offer a summer professional development course for high school teachers to explore the use of Geographical Information System (GIS) software in their classes. See MTRSD's press release for more information about the summer course. 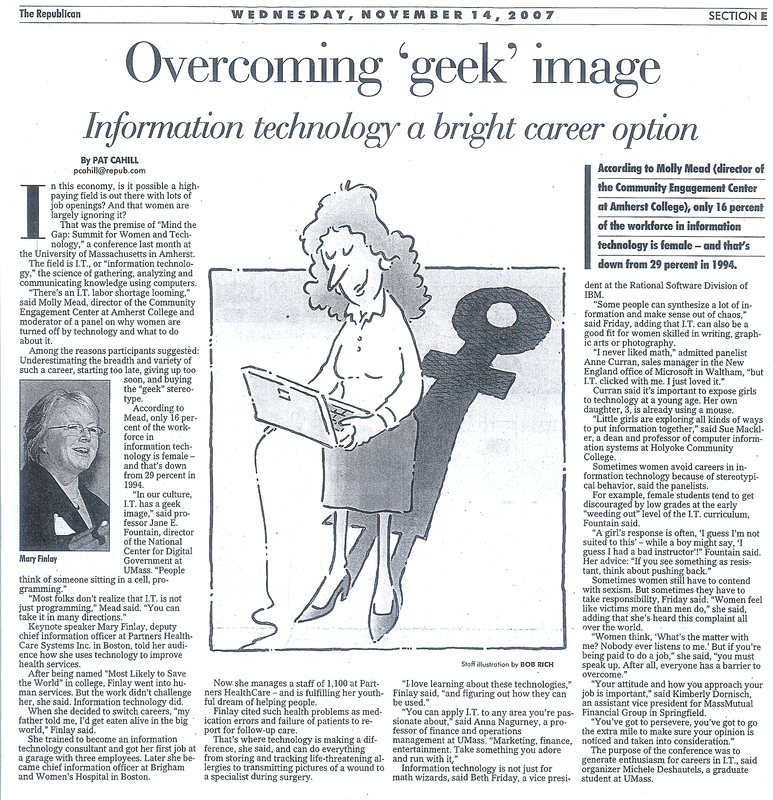 March 23, 2007: The Science, Technology and Society Initiative (STS), based in the College of Social and Behavioral Sciences (SBS) and the Center for Public Policy and Administration (CPPA), has received funding to broaden the participation of women in technology. The effort is part of a $1.9 million grant awarded to the Commonwealth Information Technology Initiative (CITI) from the National Science Foundation. Click here [PDF] for the full press release. July 9, 2007: Video and slide presentations from the May 17 workshop “Nanotechnology and Society: The Organization and Policy of Innovation” are now available through the spring 2007 workshop website. The workshop brought together more than 80 national and international faculty, public officials, scientists and students to discuss a range of important issues related to the societal implications of emerging nanoscale technologies, including Technology innovation and dispute resolution, the role of the media in forming public opinion and informing public policy on emergent technologies, visual perception of nanoscale phenomena, and the organization and economics of the nanotechnology research and development enterprise. November 10, 2006: A video of Jane Fountain's Keynote Speech "The Semantic Web and Networked Governance: Promise and Challenges," given at the 5th International Semantic Web Conference in Athens, GA is now available online. An abstract of the speech is available here, and an interview with Fountain is available here. October 6, 2006: Charles Schweik will give invited presentations at the International Institute for Software Technology at the United Nations University in Macao, China on October 9, 2006 and at the First US-China International Workshop on Digital Government Research and Practice (IntDG 2006) in Beijing, China on October 12, 2006. Download a press release here (PDF). August 22, 2006: The National Center for Digital Government is pleased to announce that Charles Schweik has been appointed the Center's Associate Director. [ more]. May 8, 2006: The new Science, Technology and Society (STS) Initiative, based in the College of Social and Behavioral Sciences (SBS) and the Center for Public Policy and Administration (CPPA), will lead a major initiative to define and articulate the societal implications of nanotechnology. This new research effort is part of a five-year $16 million grant from the National Science Foundation (NSF) and an additional $7 million in university and state funding that will establish the Center for Hierarchical Manufacturing (CHM) at UMass Amherst. 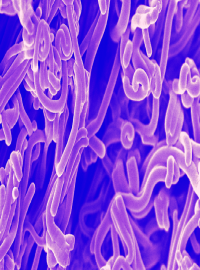 The STS Initiative, led by Jane Fountain, professor of political science and public policy, involves a team of SBS faculty researchers engaged with several dimensions of the societal impacts of nanotechnology, including communications, public values and perceptions, dispute resolution, and government regulation. To read more, click here. December 19, 2005: Political Science and Public Policy Professor and Director fo the Science, Technology and Society Initiative, Jane E. Fountain, was profiled by the College of Social and Behavioral Sciences. Click here to read the full article. Professor Jane Fountain was a keynote speaker at the 2005 International Conference on "Knowledge Management in Asia Pacific," held in Wellington, New Zealand, on November 28th. Click here for full press release.